This excellent anthology, assembled by two leading scholars of modern art, investigates a pivotal, yet overlooked moment in twentieth-century cultural history—the years 1959 and 1960. Although the period covered by the volume is limited, it encompasses a range of mediums—visual art, film, writing, theatre, and music—and works from several countries in Europe and the Americas. Serge Guilbaut and John O’Brian argue that this period was a turning point in both global politics and the arts. In 1959, Fidel Castro seized power in Cuba and Charles de Gaulle was proclaimed President of France’s Fifth Republic. As Cold War tensions between the US and the Soviet Union escalated, several African countries established independence from colonial rule. In the art world, changes were no less tumultuous, with the passion for nominating things “new”—New Wave, nouveau réalisme, the Nouveau Roman—demonstrating that a radically different set of affairs was in place. Among the significant developments that occurred in this period—many of which are discussed in this volume—are the breakdown of the classic Hollywood studio system; the evacuation of the authorial subject in the Nouveau Roman; and the fluid exchange of jazz music between the US and France. 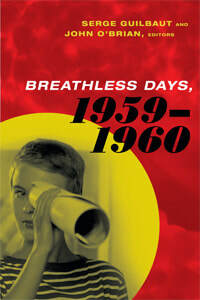 Contemporary artists, writers, and filmmakers were rendered “breathless” by the pace of events. The editors of this collection, who are both at the University of British Columbia, have impressive track records as historians of European and American modernism. O’Brian is the editor of Clement Greenberg: The Collected Essays and Criticism (1983–1993), and Guibault wrote the landmark study How New York Stole the Idea of Modern Art (1983). One of their major contributions to the field, evident in Guilbault’s earlier anthology Reconstructing Modernism (1990), has been to demonstrate that the torch of modern art did not pass from Europe to the US after World War II. On the contrary, as Breathless Days amply demonstrates, innovative art was produced on both sides of the Atlantic in the 1950s and 1960s. Not everything in this period was completely new. Robert Lebel’s 1959 monograph on the work of Marcel Duchamp brought the French artist’s pranksterish conceptual art from fifty years earlier to the attention of a new generation in Europe and America. This, along with a renewed attention to other avant-garde artists such as Francis Picabia—as Tom McDonough’s essay in the book documents—led to a permanent shift in the contemporary art world. However, some cultural forces were for preservation rather than change. The French art world, Richard Leeman argues in his essay on concurrent 1959 exhibitions in Paris and New York, defended its position as the centre of high culture by promoting the work of established artists, such as Matisse and Picasso, while overlooking more dynamic art being born elsewhere. Several themes emerge in the anthology. As many of its authors argue, the highly personalized, individual production of the creative artist was put under enormous pressure in this period, both from a kind of strain caused by artistic and critical overuse and from the proliferation of other, more popular forms of culture competing with high art. Artists, filmmakers, and writers responded by creating works subject to forces beyond their control, including chance, the proliferation of mass media, and the activities of the reader, viewer, or audience. For example, the famous “jump cut” of Jean-Luc Godard’s 1960 gangster film À bout de souffle—from which this book takes its title—shattered cinematic illusion and forced viewers to engage actively with the artistic material on the screen. As Kjeti Rødje argues, cinemagoers in the US were prompted to adopt an even more dynamic role when seats in the auditorium of William Castle’s 1959 film The Tingler were made to vibrate, eliciting physical reactions from the audience who thereby participated in creating the overall spectacle. Authors, artists, and auteurs in this period also engaged with transformations taking place in broader society, including political upheavals, an ever-accelerating industrialization, and a burgeoning commodity culture. In a further, intriguing development—the documentation of which constitutes a major contribution of this book—some artists looked to the past to examine suppressed knowledge about art’s history and the traumatic experiences of World War II. Foremost among the essays is Hadrien Laroche’s study of Marcel Duchamp. When, in 1964, the French Dadaist created replicas of his “readymade” sculptures—utilitarian objects he had designated as artworks between 1913 and 1921—many argued that Duchamp had betrayed his original anti-art stance. As Laroche explains, however, the critical impulse behind this initiative was foreshadowed in a 1959 work Tongue in my Cheek. This enigmatic piece was composed of a drawing of Duchamp’s profile, a cast of the lower part of his face, and a signature: a portrait, an imprint, and the artist’s proper name. Duchamp thereby attacked the presumption that identity was a coherent notion and addressed recent global threats to identity, including the crimes against humanity committed during World War II. In this work, and in the copies of his readymade sculptures that soon followed, the quest for identity leads into a never-ending, abyssal spiral. In the process, the very idea of the artist “Duchamp” and his purported legacy unravels. In another notable contribution, Jill Carrick investigates the 1960 work of Arman and Daniel Spoerri, members of the European nouveau réalisme movement, who introduced everyday objects into their compositions. Carrick refuses a longstanding misconception of these artists as a “neo-avant-garde” repetition of the Dada movement of the 1910s and 1920s by arguing that they were exploring post-traumatic memory. If Arman’s accumulations of discarded dentures, human hair, and eyeglasses evoke the Holocaust, Spoerri’s trap-pictures—unfinished meals presented as relief sculptures on upended table tops—evoke departures and extinctions in a manner combining humour and dread. Describing these works as “traumatic realism,” Carrick argues that they allow otherwise repressed wartime experiences to emerge. Mari Dumett’s essay on Jean Tinguely—another member of the nouveau réalistes—also opens new theoretical vistas onto the work of this movement. Dumett shows how Tinguely’s work should be understood, not as neo-Dada, but rather as “meta-Dada.” Through this concept, in which the prefix “meta” is taken to mean both “with” and “after,” Tinguely’s Homage to New York (1960)—a kind of machine that performs its own destruction—can be seen as producing “an alternative understanding of the system” of contemporary capitalism that saw “beyond its protocols of efficiency, utility and control” (172). Clint Burnham’s essay examines William Burroughs’ 1959 novel Naked Lunch. Comparing it to Jacques Lacan’s contemporary The Ethics of Psychoanalysis, Burnham takes the series of challenging beings and objects in the text as an opportunity to investigate the concept of the “neighbour.” Lacan argues that the command to “love one’s neighbour” is intolerable, because we discover therein not the “other,” but our own desires mirrored in an inadmissible form; the bizarre cavalcade of junkies, queers, and talking assholes that populate Naked Lunch similarly express a horror of the self. Burnham’s innovative reading of Burroughs’ refusal to normalize the neighbour is energized in his essay as a critique of French colonial politics in 1959–1960, and of recent gentrification programs that convert urban areas, such as Vancouver’s Skid Row district, into “middle class playgrounds” by domesticating their former inhabitants (184). Significant space is dedicated to artworks produced beyond the usual North-American and European circuits in chapters by Antonio Eligio (Tonel) on Cuba and Aleca Le Blanc on Brazil. As Eligio demonstrates, in irreverent and radical artworks produced after Cuba’s change of government in 1959, Chago (Santiago Armada) challenged the conventionally patriotic local imagery with vulgar artworks in a carnivalesque mode that undercut more sanitized contemporary depictions of nationhood under Fidel Castro. Le Blanc’s discussion of Brazilian visual culture focuses on the misfit between the utopian modernist architectural projects underway in the nation’s newly minted capital Brasilia and 1959 photographs of the city by Marcel Gautherot, which showed chaotic works in progress covered in scaffolding and ramshackle, improvised structures created by labourers working on the nation’s vast urban planning initiatives. Surprisingly, few of the chapters deal with intermedia practices and remain instead within the discrete boundaries of an individual discipline. Also, and this is perhaps to be expected in a volume with such a large range and number of contributors, there is some unevenness among the essays. I would question Aleca Le Blanc’s contention that a 1959 grid-like magazine layout by the Brazilian neo-concrete artist Amílcar de Castro “reflects the designer’s subjectivity,” and contest Carla Benzan’s argument for the “transcendent pretensions” of the Italian artist Lucio Fontana’s slashed paintings of the late 1950s (247; 287). Putting these quibbles aside, by insisting on the fluidity between low and high culture, and by turning attention to works and practitioners beyond Europe and North America, this book allows the reader to look at postwar art and literature afresh and repudiates the outworn narrative of postwar culture as a form of cultural progress. It should be considered essential reading for those seeking a deeper understanding of a fascinating range of works created in a turbulent period of twentieth-century history. Anthony White is a Senior Lecturer in the School of Culture and Communication at the University of Melbourne.